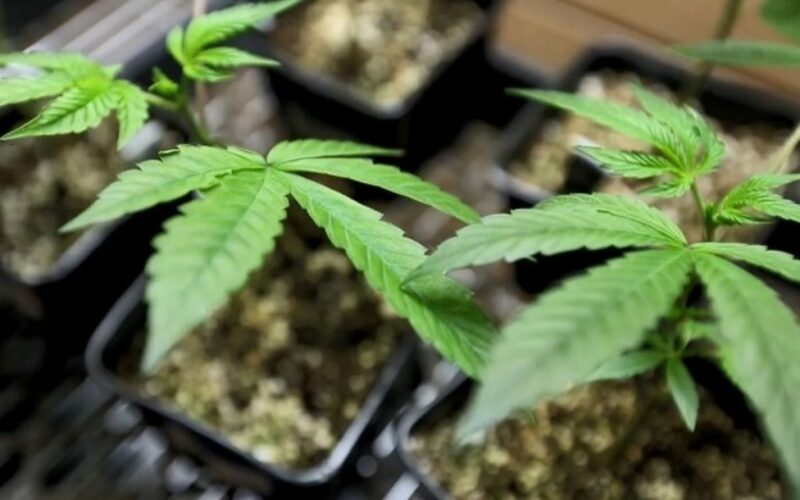 Suddenly and without warning, Village Farms International Inc (TSE:VFF) (NASDAQ:VFF) (FRA:O2V) became the cannabis sector’s latest Citron Research victim. While their thesis appeared more of an indictment of VFF’s JV partner than the company itself, another issue stuck out as we analyzed the ex post facto details: Citron’s tweet just happened to coincide with the company in a delicate technical position. We examine further. In the course of yet another benign day in Canadian weedstocks, Citron Research delivered a jarring bodycheck that shook the status quo. Completely out of the blue—as per usual—Citron delivered their bearish thesis on Village Farms International, which careened ↓19.36%—peak-to-trough—within 46 minutes of tweeting online to its 113K followers. While it’s beyond of the scope of this article to editorialize on the merits of the report itself (overall, we think it’s pretty weak), a glaring fact becomes obvious after-the-fact. It appears the report and subsequent tweet were delivered at a time when VFF was technically vulnerable. Moving right to the charts, we note how everything happened to coincide with VFF straddling important technical levels. 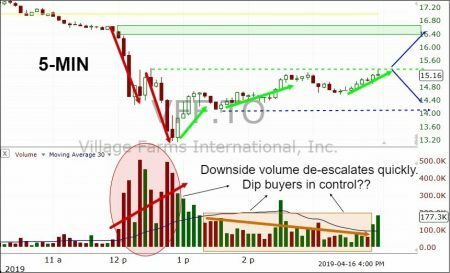 Fifteen minutes before the tweet ensued (12:05 pm EST; the report was presumably released on CR’s website a few minutes prior), Village Farms International closed at C$16.61—a shade below the March 27th low and above both the March 13th and April 15th yesterday’s pivot lows. 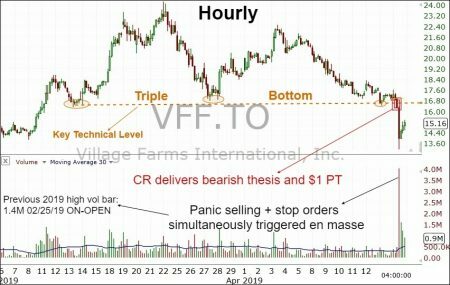 Essentially, VFF was probing a triple bottom with volume at its lowest hourly average in a month. And then, the thunderbolt hit. Under such auspicious timing, Village Farms didn’t stand a chance—especially with the throngs of profit-takers at the ready with VFF up ↑375% in 2019. Needing only a few cents to breach key technical levels and invite a torrent of likely stop loss/stop profit and predatory technical algo sniffers to the table, that’s exactly what happened. At over 4-million shares traded during the hour between 12:00-1:00pm, this volume eclipsed the previous 2019 high water mark of 1.4 million shares traded on February 25th on-open. Now, we certainly cannot prove that Citron Research timed their hit piece to coincide with VFF vulnerable to shock. But if one was dedicated to inflicting maximum damage, doing so at a key technical junction would be the time to do it. Had they released their “research” last week with VFF at C$17.50 or C$18.00, bulls might have had time to regroup and “un-trigger” the slide at the March lows. Today, not so much. While we’re at it, the timing of Citron Research’s report seems quite odd. Irrespective of Village Farms relationship with Emerald Health Therapeutics—which is a separate issue altogether—the company’s prospects appear on the upswing. With the financing of their 50%-owned joint venture of Pure Sunfarms and new working capital (almost) secured; and with the company producing positive cash flow from operations in the last quarterly reporting period, why bet against Village Farms now? Why not wait a few quarters to see whether Village Farms hockey stick growth curve materializes or not? Sure, it’s entirely within the realm of possibility that overcapacity, a lack of execution, or other factors crimps the company’s business model down the line. Most sector players face such endemic risks. But to ascribe a $1/share price target right now, with the Farm Bill passed, Texas commercial hemp farming program coming to fruition and ability to raise money seems quite sensationalist and unwarranted. Time will tell. Until then, we think VFF has an opportunity to rebound in the short term; at least to previous triple bottom breakdown levels. Why? Because it appears the torrential downside volume was predominantly stop loss/stop profit generated, and not of the sustained variety brought about by an actionable bear thesis. We believe investors will see through Citron Research’s nefarious maneuver, which surely involved timing their call to inflict maximum damage with VFF technically-vulnerable.